Travel log about Aral Sea in Kazakhstan. Growing magnet for travellers in Kazakhstan. At the end of 1950s the Aral Sea, in surface area, was the second largest inland body of water in the Soviet Union, behind the Caspian Sea, and the fourth largest in the world lagging behind only two more other lakes, i.e. Lake Superior, and Lake Victoria. This terminal (with no outlets) saline lake, surrounded by the Karakum (Black Sands) and Kyzylkum (Red Sands) deserts, and the Usturt Plateau, because of its size and significance was regarded by people from ancient times as a sea. Its water supply has been replenished by two major rivers of Central Asia: the Amudarya (2,540 km) and the Syrdarya (3,019 km). The Amudarya, the largest river in the area regarding its basin, starts in the Hindu Kush mountains and flows through Kyrgyzstan, Tajikistan, Uzbekistan (forming border with Afganistan), Turkmenistan, again Uzbekistan and then into the Aral Sea. The Syrdarya begins in the central Tien Shan mountains in Kyrgyzstan and flows through Tajikistan, Uzbekistan, Kazakhstan and then into the Aral Sea. Therefore, though the Aral Sea itself lies between Uzbekistan and Kazakhstan, all five newly independent states of Central Asia share the Aral Sea basin, an area of 690,000 square km. They are Kazakhstan, Kyrgyzstan, Tajikistan, Turkmenistan, and Uzbekistan. (A small portion of the Aral Sea Basin's headwaters is located in China and Iran. Afganistan directly shares the Amudarya river, which forming a border between it and Uzbekistan, partially Tajikistan and Turkmenistan. However, so far contribution of countries outside the FSU, including Afganistan, was not tangible. Perhaps, in the future after the establishment of real peace in Afganistan and before the enlargement of its economic activities, especially irrigation, in northern arable lands, it will be vitally important to involve into the legal framework of fair allocation of the region's precious water resources here as well). Since both the causes and the consequences of the Aral Sea catastrophe today are mainly connected with Post-Soviet Central Asia, this paper will concentrate on the five above-mentioned newly independent states. The fertile arable land between the two Central Asian rivers is an ancient settlement area with a history of approximately 3500 years. Archaeological discoveries have revealed irrigation systems that provided water for millions of hectares. However, modern hydrotechnology, mechanization and chemical application used in unreasonably high scales in the second half of 20th century has adversely affected the Aral Sea Basin. Until about 1960, the volume of the Aral was more or less in equilibrium, with evaporation from the surface being counterbalanced by inflow from rivers, groundwater and rainfall. 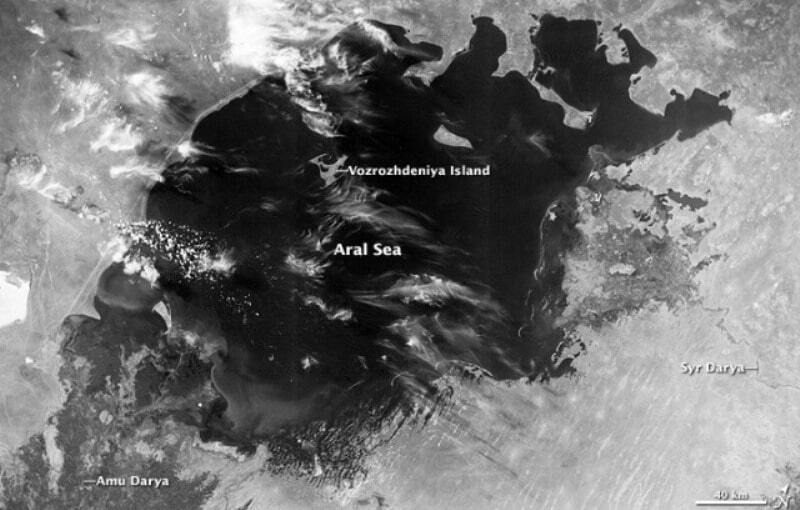 In 1960 the mean level of the Aral Sea was measured at 53.4 m, its surface area at 66,000 square km, and its salinity at about 10 grams per liter. About 90 per cent of the water in the sea was drawn from the two rivers, prior 1960 the contribution of the Amudarya was about 73 cubic km and the Syrdarya about 37 cubic km per year on average. Since then its level has dropped drastically by more than 13-17m and now it is only about 35-39m deep (the 1980s saw the most dramatic falls, when the loss was about 90 cm a year). The surface decreased by more than two times and the volume more than 4 times, its salinity increased more than 3 times (reaching almost the same levels of a seawater in the open ocean, for example the Arctic ocean). The combined flow of these two rivers diminished from about 60 mln. cubic m in 1959 to 42.9 in 1961 - 1970, and 16.1 for 1971 - 1980, and lowered to 4.2 mln. cubic m in 1981 - 1985 per year on average. The Syrdarya ceased flowing in 1978 - 1984, and the Amudarya supplies only a minimal and ever diminishing volume of its water. (Since the construction of the 1,200-km Karakum canal in Turkmenistan beginning in 1954 and diversion of water to this largest Central Asian man-made "river" in the Karakum desert was more than the entire stream flow of the upper portion for the Syrdarya. The Canal flows directly over loose sand, and overall losses through filtration are estimated at one third of all water used for irrigation in Turkmenistan). By the time of the almost total diversion of inflowing water, the excessive use of agricultural chemicals (more than ten times of average former Soviet Union (FSU) or the U.S.A.) together with industrial and municipal pollution had already extremely degraded the quality of the water. The desiccation and degradation of water resulted in the destruction of the ecosystem of the Aral Sea, with the deltas and the basin of its two main rivers suffering most. Wetlands are now deserts, biodiversity is decimated and wind blows salts and pesticides from the exposed sea bed over crops, which is leading to a desertification of the surrounding area. 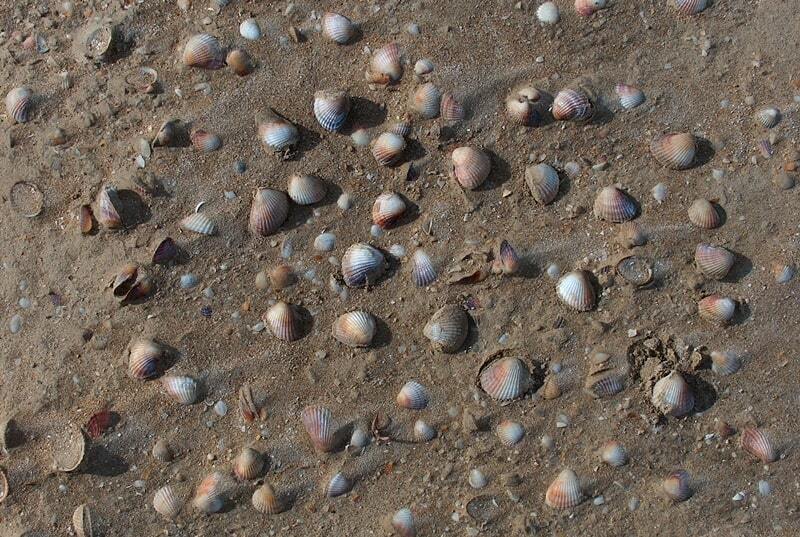 The dried up sea bottom now covers an area more than 33,000 square km. The shore line has retreated by 60-80 km. The exposure of over three mln. hectares of dried up sea bed covered with polluted salt is a source of salt, and dust storms arising from its surface now carry some 75 mln. tons and can move in belts as broad as 40 km, damaging soil thousands of km away. The large scale drying up of the Aral Sea has decreased the sea's warming effect in winter time and its cooling effect in summer time. The increased contrast of temperatures at the land-sea boundary has contributed to increased wind velocity and dust storms. Aral Sea deposits, as research has shown, are now reaching as far away as the Himalayan Peaks, and the Pacific and the Atlantic Oceans. Formation of dunes in the exposed river deltas and the wind erosion processes intensify desertification. Salt-laden sand dust destroys up to 15,000 hectares of pasture land every year, and soil productivity has plummeted. The sharp changes in the environment affected the wild life in the area: the number of mammals and birds has been reduced by half. There are no fish in the Aral; today it is biologically dead because of over-mineralization and poisoning of its water by fertilizers and pesticides. All these, having altered nature on a large scale, have drastically and adversely affected the lives of 35 mln. people in the Aral Sea basin, especially the more than 3mln. people who live in the immediate zone of the calamity. The Kyzyl-Orda region (Kazakhstan) is also among those areas hardest hit by the environmental catastrophe. The northern half of the Aral Sea, including the lower portion of the Syrdaryia, lies within Kazakstan's Kyzyl-Orda region. Extensive irrigation work, mainly for the cultivation of cotton in the south of Kazakhstan as well as in other cotton-sewing Central Asian republics, and intensive agriculture over the past 30 years, with excessive use of fertilizers and pesticides, have caused pollution of the groundwater, extensive salinization of soil and, as a result, a reduction in agricultural yield. Previously important local food crops such as rice can no longer be grown effectively, which has resulted in a dramatic decline in economic activity. The most adversely affected regions in Kazakhstan are the Aralsk and Kazalinsk districts in the Kyzyl-Orda region. Economic losses of the Kyzyl-Orda region only due to the Aral Sea crisis in the past 30 years are estimated at U.S.$3 billion, mainly as a result of the decline in natural resources and the subsequent loss of employment. 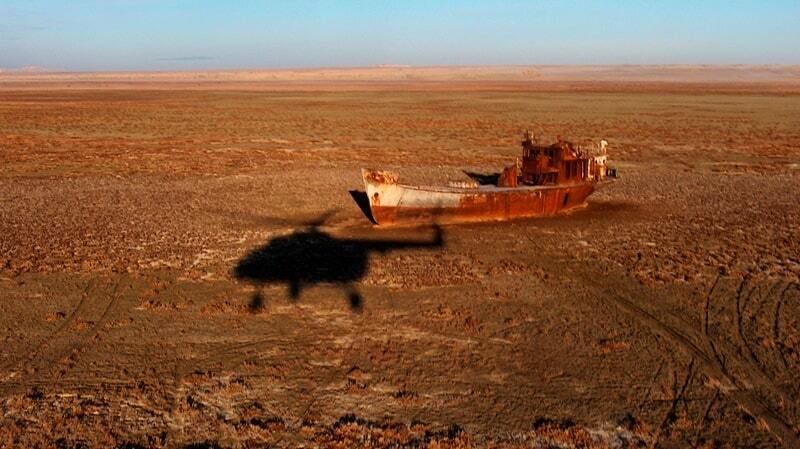 Commercial fishing and shipping in the Aral Sea was abandoned in the mid-1980s, while the region's two major factories (fish-producing and pulp paper) had to switch to more expensive, imported raw materials of inputs, after the disappearance of local fish and reeds. Half the population (mainly non-indigenous) left the region. The water supply in the area depends on the Syrdarya and its system of irrigation canals, artesian groundwater, highly saline shallow groundwater wells, and springs. Surface water from the Syrdarya is partially treated in the Kazalinsk Water Treatment Plant. Inadequate maintenance of the system, high levels of leakage, the rapid deterioration of water quality from existing wells, and harsh climatic conditions have all contributed to the severe deterioration of the existing piped water supply system.